Google is never shy about dangling a carrot filled with freebies to attract more people to a service. It’s not always worth the bargain, especially if you’re sensitive about how much information you’re handing over to the tech giant. Yet Local Guides is one program that might be worth a look if you like to travel or check out the newest eateries in town. This also gives you another outlet besides Yelp to rate your favorites or call out those who offer terrible service. The Local Guides program offers you free Google Drive storage and the promise of insider access if you’re willing to put in the time. It’s actually pretty fun to build a social presence on Google Maps and boost your ranking, all while making Maps more accurate and reliable. The Local Guides program reels you in with a quick boost up the ladder. There are five levels, and you ascend in ranking by earning points for reviews, photos, adding/editing places, and answering questions. It’s pretty easy to make your way up to level three, which gives you a snazzy little icon next to your profile to indicate you’re a bonafide Local Guide. A Local Guide icon will appear next to your profile image to show that your review is worthy of trust. The first couple of levels are pretty sparse with benefits, offering only a monthly newsletter and invites to an occasional Google Hangout. Google details all the benefits for each particular level on this help page. The goodies really come in when you hit level four. That’s where you get terabyte of Google Drive storage for two years and an annual mystery thank-you gift. With level five you’re supposed to get proprietary information about what’s coming with Maps and a possible invite to a Local Guides Summit. My goal is to push my way there to find out how special any of these rewards actually turn out to be. The general idea is pretty simple: add reviews, photos, and new locations in Google Maps. Google wants reviews and star rankings to be fair, so don’t go overboard if someone burned your cheeseburger. Not surprisingly, you’ll earn your stripes faster if you embrace a few of Google’s other services. Be sure to turn on Google Photos and enable Location History in Maps, you’ll start to see some rather cool (yet slightly creepy) integration of your photos everywhere you’ve been with your phone. Good news: your entire location history is available in Google Maps! Bad news: well, you can probably figure it out. Photos will appear along any of the places Google thinks you’ve stopped at. It actually makes a neat trip summary for vacations, as you can see where you went each day and check out what photos you took with your phone. There’s potential here to integrate this further into the stories that Google Photos automatically creates from your image gallery. So to add images for reviews you just have to tap one of the locations you visited and then you can add write the review and add the pictures. You get more points with both images and reviews together, so snap away. Another way to score: add new venues to Google Maps. You’d be surprised how often a restaurant, coffee shop, or store hours are incorrect or not listed at all. If you add in the name, address, hours, and other details about the place you’ll get a nice points boost (though these will sit in a review queue before they go live). Plus, you’ll be doing a somewhat altruistic service to your fellow humans. We all get a taco craving from time to time, so add in that new Mexican restaurant that just opened down the street (as I did recently). Your fellow citizens will thank you. Also, don’t overlook these occasional questions that will pop up about places you’ve visited. Add to the Google Maps knowledge database by answering many, many questions about where you’ve been. You have to answer a lot of them to earn Local Guides points, but they’re pretty easy and will help you boost up your ranking quickly. The questions don’t always pertain to the particular type of locale, though. You’ll sometimes get questions about men’s clothing choices at a houseware store, but just go with it anyway. Is the tradeoff worth it? If you follow such a strategy, you’ll be a Local Guide master in no time. But as you’ve probably realized, you’ll give Google a whole lot of information about yourself. In exchange for some cool freebies and a streamlined timeline of your trips, everywhere you went with your phone will be recorded in your Google account. If this freaks you out a little, then you can always delete your history whenever you want. You can keep using Maps and participating in the Local Guides program after you do this, but any of the benefits from looking at past vacations will be gone. 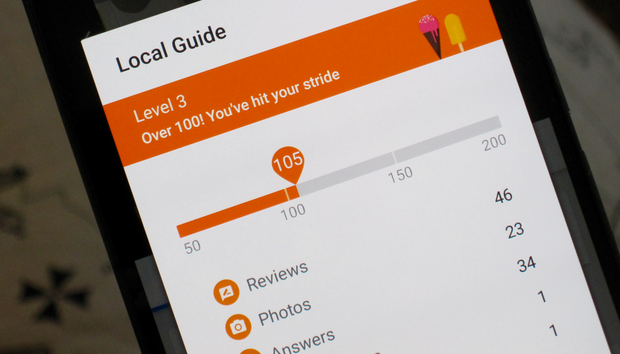 The Android integration to craft a strong Local Guides experience is rather well done, so if you don’t mind the data tradeoff you may find yourself with oodles of free storage and some invites to Google events. If you want to get started, head to the Local Guides sign-up page and get cracking on your first batch of reviews.